Ganga Speaks With Her Eyes! Ganga’s eyes focus on the screen, then on the boxes, and when she holds her gaze long enough, the words are said via digital voice. This is her first day working with the materials prepared for her. But given her dry humor and tendency for being naughty (or cheeky as our Australian friends say) this could well be what she intended to tell us. “Do something else, bored, bored, bored,” became her first words. Buying the Tobii was a leap of faith. I’ve had my eye on this type of technology for her. She has worked with switches, head pointers, and specialized keyboards, but always hampered by her severe motor limitations. The eye tracker offered the ability to operate windows in addition to the specialized communication software. 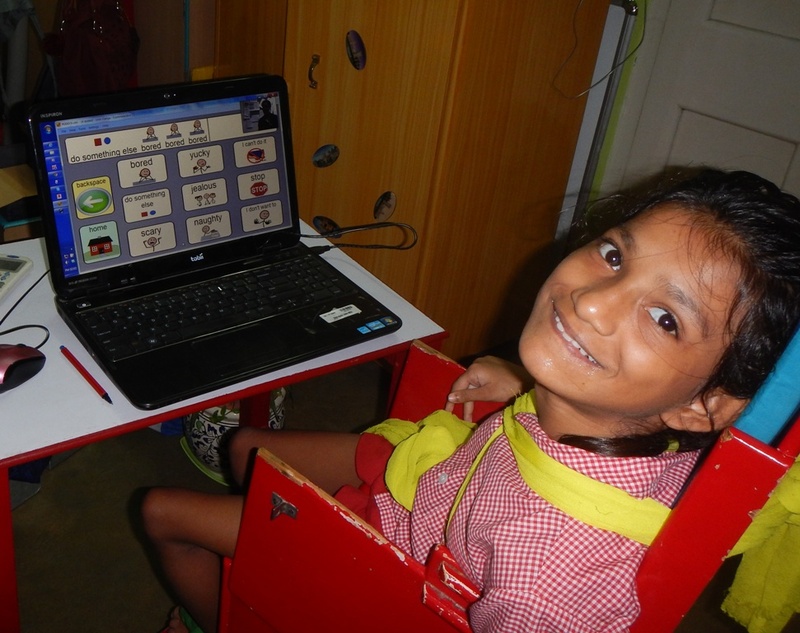 She could eventually learn to surf the web, without ever having to use her hands or fingers. This version of eye tracking, originally used for gaming was said to be less sensitive to head motion. Buying without any chance to try it felt reckless. But I kept coming back to Ganga’s current and future needs to break out of the isolation of her disabilities. Among all our girls, she is the one who tries the hardest, loves to study the most, cares about geography, history, and news, and understands humor and sarcasm. I placed the order with the company in Mumbai that sells the product made in Sweden. Apparently we were their first customers for the Tobii PCEye. Soon after we purchased the Tobii but before it arrived, we had an amazing group of volunteers from Equal Health in Australia, all connected with early childhood education and disabilities who came to help and guide us for a week. Their leader Kristy Tomlinson contacted her friend Amy Litton of Independent Living Center in Nedlands. Amy Litton is a TRAINER in the use of the Tobii as well as other assistive devices. She and her team enthusiastically offered to help Ganga. Below is a Skype screen shot of speech pathologist Amy Litton and occupational therapist Jessica Rigden learning about Ganga. 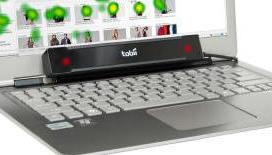 This is a clearer picture of the Tobii PCEye Tracker, the little black device at the bottom of the screen. The red dots are where the infared lights connect with her eyes in order to operate the laptop. This is one of the personalized pages Amy and her team prepared for Ganga. When the circle is complete, namely when she had held her gaze long enough, the sound will play. In both the above pictures there is a side bar on the right, representing eye tracker control of mouse functions. 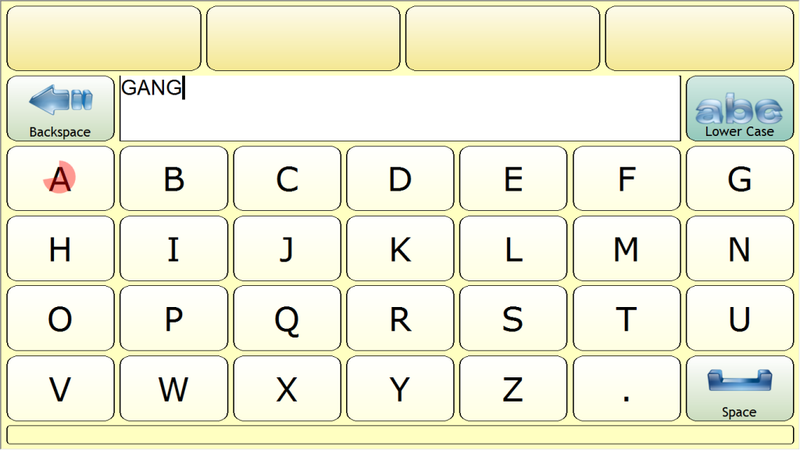 Between substituting mouse functions and using the screen keyboard, the usual Microsoft and internet work can be accomplished. 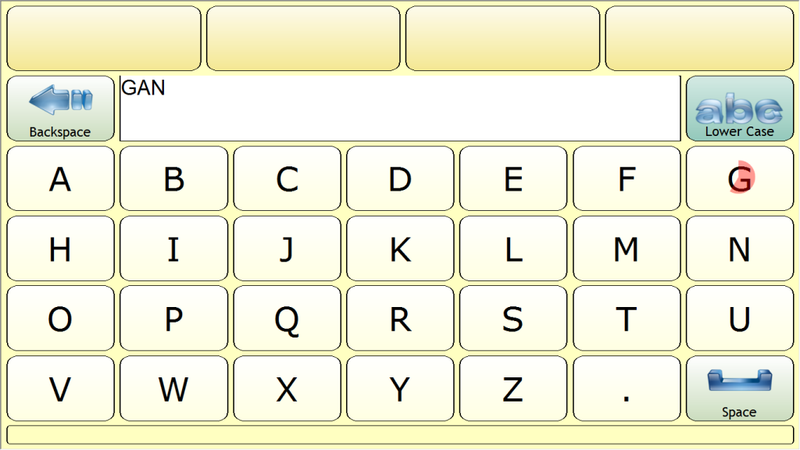 A keyboard can be called up at any time and operated by eye tracking. Ganga has already typed GAN and is focusing on the G. The red circle fills as she holds her gaze. Now Ganga has already typed GANG and is focusing on the A. The red circle fills as she holds her gaze. Ganga’s eyes do speak. She is telling us that she has done well and now she deserves a photograph. Good work Ganga. So many of us are waiting to hear what you are thinking, what you dream about, what you want us to know about yourself, and some day to read the book you want to write. What an incredible corridor into life you created for Ganga! So many doors for her to open! So many ripenings in so many directions made possible! I’m awed by you. Bravo! All the best to all if you! This is so very unbelievably wonderful! Way to go, Ganga! Great idea, Michelle! Great work! I admire your perseverance. The wonder of this amazing thing and its possibilities brought tears to my eyes. Michelle, I have read in this site about all your trials and tribulations in running the place. I have often wondered about the rewards, both outer and inner, that come your way. It makes many of us think. Sometimes a story like this makes us believe in … well, just makes us believe. Bless you. Dipak, the rewards are constant, and even in the midst of the trials and tribulations, they do not diminish. I worry a lot, but that’s just part of life. Thank you, and thank you all. Never stop believing, even the seemingly impossible.